PWP Offering Rebates for EVs and EV Chargers! To qualify, you must have an active PWP electric account, be the legal owner of the EV and permanently reside at the address shown on the PWP account. The rebate is limited (if you can call this a limitation!) to two EVs every three years! Now that you have an EV, you need a charger and PWP is offering rebates on those as well! A standard Level 2 (240 VAC) charger qualifies for a $200 rebate, but a Wi-Fi enabled Level 2 charger qualifies for a $600 rebate! You must complete the online rebate application within 180 days of purchase. To get started, check out PWP’s EV rebate page here. PWP Rebates Fall August 1! 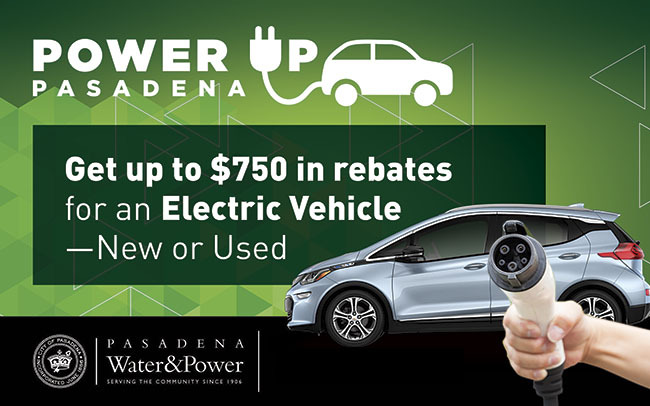 As we have noted many times in the past, Pasadena has one of the best solar rebate programs around - decent rebates, a well managed program, and good communications. Consistent with that approach we have just learned that the solar rebates are going to be reduced effective August 1st. That means that rebate applications submitted prior to then, and which are deemed complete when submitted, will qualify for the current rebate. Once the rebate is reserved, you would then have a year to complete the project. Potential residential or commercial clients, your rebate will drop from 45¢/Watt to 30¢/Watt. That means that for a typical residential project of 5 kW, the rebate will drop from $2,250 to $1,500. Non-profits will leave even more money on the table if they miss the August 1 deadline. For a typical 40 kW school project, the rebate will drop from $36,000 to $24,000! Ouch! If past is prologue, this drop in the rebate amount will create a stampede as folks try to lock in the current rebate rate before it steps down. If you are in PWP’s service area, please don’t wait, give us a call today!